What Is The Bitcoin Mempool & Why It Matters?? Every day, I see more and more people joining the realm of Bitcoin. I would even say that 2017 has been the “year of Bitcoin”. Despite several low points (the fork of Bitcoin Cash, China’s ICO ban, bad press, etc. ), Bitcoin has shown resilience and an ever-increasing adoption interest throughout the globe. This surge makes sense because Bitcoin is a revolutionary and trustless system, and it has proven to be a safe haven for people around the world against their government’s inflationary policies for many years now. But apart from being trustless, Bitcoin is also quite complex and has a demanding learning curve. I always tell my friends to make sure that they have a decent grasp of the Bitcoin infrastructure and its workings before they decide to store a significant amount of value in it. And that’s why I keep sharing Bitcoin-specific things on CoinSutra every now and then. You need to remain aware so that you don’t fall too far out of the loop. So today, I am going to tell you about a very important part of Bitcoin’s transaction workflow – Mempool. The Bitcoin mempool is the pool of unconfirmed Bitcoin transactions on the Bitcoin network. Once a Bitcoin transaction happens on Bitcoin’s blockchain, it is not immediately added; instead, it goes into this pool of in-motion transactions. Each running full node on the Bitcoin network is connected to this mempool, especially the miners. The miners, working at their respective nodes, collate a bunch of transactions from this mempool, and then they try to solve an energy-intensive math problem. The collection of these transactions is called a “block”, and whichever miner first solves the math problem gets to add this block to Bitcoin’s blockchain. This is the first confirmation of that block. Though the mempool may look like a very simple concept to understand, it has a very complex application. The question is how do certain transactions get picked out of the mempool before others? Bitcoin’s block time is 10 minutes, but we all experience extreme delays from time to time in getting our transactions confirmed. This happens because miners are not picking out our transactions from the mempool. As I have shared with you in the Bitcoin hash article, miners win a lottery of 12.5 BTC every time they successfully mine a Bitcoin block. But apart from this fixed lottery of 12.5 BTC, miners also get a bonus amount of bitcoins for successfully mining a block. This bonus is called the “Bitcoin mining fee”. So when a miner successfully mines a block, they get 12.5 BTC plus X amount of transaction fees, which is a cumulative sum of all the transaction fees in that block. As you can see in the above image, miners or mining pools (Bitcoin.com, BitFury, BitClub, etc.) get an additional reward on top of the standard 12.5 BTC block reward. And that’s why it stands to reason that a miner will pick to mine the blocks in the mempool with higher transaction fees. And this is the reason that our Bitcoin transactions sometimes get “stuck” in the mempool and are not picked up until several hours (maybe even days) later. So how do I get a faster Bitcoin transaction? 1. The most obvious thing is to send transactions with a high fee attached to it. You can find the latest fee trends by using some of Bitcoin’s block explorers such as BTC.Com or Blockchain.info. For more info on block explorers, check out this post. 2. You can find out the number of unconfirmed transactions in the mempool by using this or this to calculate approximately how much time it will take for your transaction to go through. 3. 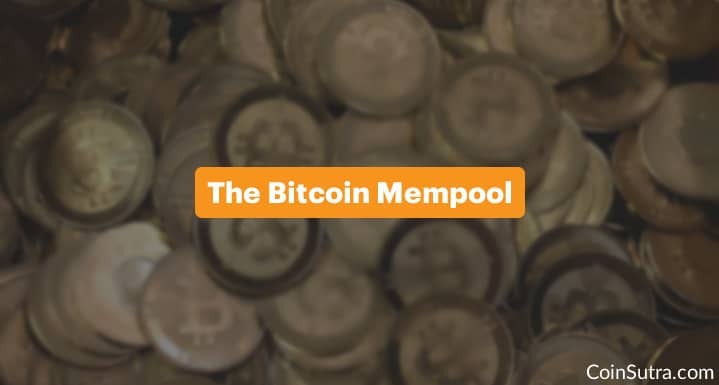 You can hold back and not do any other transaction and check here or here to analyze the current mempool size to decide whether or not making a BTC transaction now is a good idea. 4. If your transaction is “stuck”, you can use a transaction pusher or a transaction accelerator service such as this or this. ***5. Use SegWit-enabled wallets because they help in getting faster confirmations from the mempool. One thing that I would like to add here is that the mempool will soon be clogged up pretty badly (despite SegWit) because more and more people are joining the realm of Bitcoin every day. That’s why you should be prepared to hit this bottleneck again and again until this issue is finally resolved. Until that time, stay tuned to CoinSutra to learn all the tips and tricks to speed up your Bitcoin life! If you have any questions about the mempool or speeding up Bitcoin transactions, let me know in the comments below. 1 What Is The Bitcoin Mempool? 1.0.1 So how do I get a faster Bitcoin transaction?